With springtime yard cleanup and projects, sometimes you find a new project from the leftovers of an old. That was the case with this project. We decided to spruce up the kids play structure in the backyard since it was looking kind of worn and weathered. It was there when we moved in and had already been spruced up once as the evidence of chipped red barn paint. We decided to replace the horribly warped roof of the structure during the spruce up. It was a bit of an eye sore and we didn't feel it was fair to make the neighbors look at it any longer. This left me with a pile of worn warped wood that had been weathered and had chipped red barn paint on it. Distressed wood so to speak. Now I had a few choices... Toss the wood, store the wood in a pile in the garage, or make something else out of it. So I headed over to the website Knock-off-wood. It is written by a mom who likes to look at wood furniture sold by places such as Pottery Barn and draw up free plans for building it yourself for a fraction of the cost. Of course I love a deal, and am handy myself so this was a perfect fit for me. Free plans? I like free! I actually headed to their Facebook fan page and posted a picture of the wood and asked what I should build. Here was the picture I sent her. 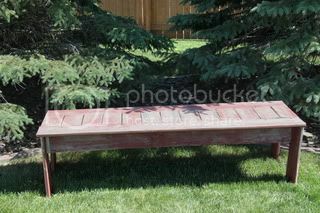 I was going to build some planters, but then decided to take Anna (the author of knock-off-woods advice and build a bench out of it. 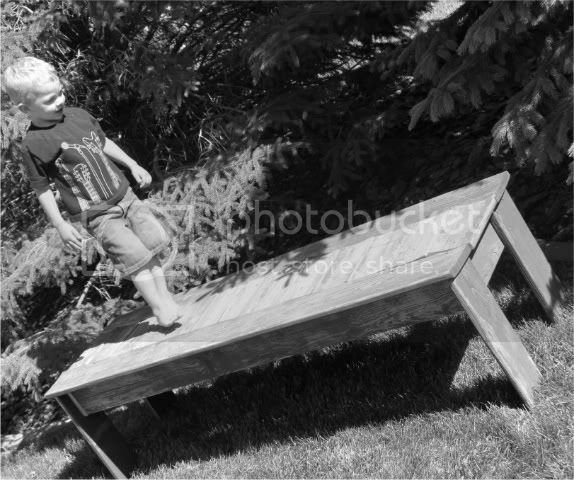 Her other suggestions were a headboard, or coffee table but since the wood was treated from wood from a play structure it was a better idea to keep it outdoors. 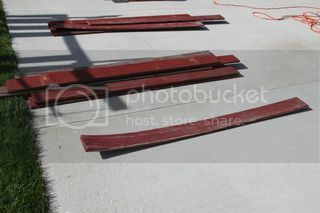 I then took the plans found here and modified them a bit to just use the boards I had taken off of the structure. I made it easier by just making it as long as the boards were already so I didn't have to trim as much and the other measurements I used were mostly just the other boards cut into 8th's or 4th's for the legs. Not too much measuring or math needed that way. This made the project go pretty quickly and I was able to do this project with my helpers playing nearby or even helping build. They are good a putting screws in holes and grabbing me things I need. The rest of the time they played in the water table, on our play structure and with squirt guns. They like making things. 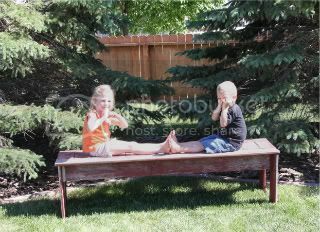 They thought it was neat that it was a pile of old wood and now it is a bench. We actually used it the day after we made it by our fire pit as we roasted smores and sat together as a family by the fire. 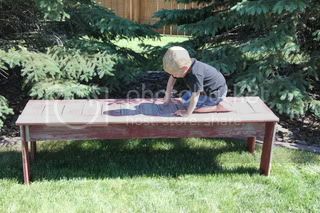 I am having a backyard event this month and it is bound to get some good use then as well! Plenty of room for four adults. Sturdy like you wouldn't believe. Anna from Knock-off Wood commented on my finished project herself! These were her words taken off of Fcebook below the picture of my finished bench. "I love this, a couple of hours and free, already distressed! This would be like hundreds of dollars in a retail store! Nice work!" I liked making this project because the wood was older and if I made a mistake and drilled a hole in the wrong place. No one will notice. It will only add to the character of the wood. It takes a lot of pressure off when you know you don't have to be perfect. You can just enjoy the process and the end product you created. 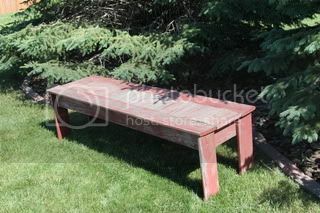 Have to add that my bench project made the bragging boards on the Knock-off Wood Blog! Check it out here! Whoohoo!